no one offers a sweeping move to solve the problem. LARGO - Gloria N. Ellinwood thinks insurance companies should be barred from creating spinoffs that serve only Florida. 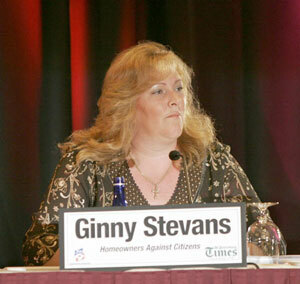 Ginny Stevans doesn't like how insurers can buy reinsurance from their parent company. Debby Zolobkowski says it's unfair that her premium can be tied to her credit rating. 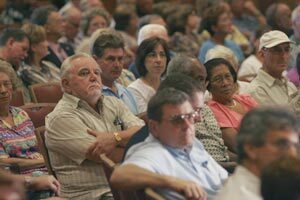 They were among the 150 or so residents who turned up for the all-day meeting of the Property and Casualty Insurance Reform Committee, one of the recent state attempts to curb soaring insurance costs strangling many homeowners. Of those at the meeting - business people, retirees, politicians, and the committee members - no one denied Florida's insurance situation needs fixing. But few could agree on the best way to repair it. During a roundtable discussion among the 15 committee members, no proposal escaped criticism, re-enforcing how their undertaking - to fix the insurance crisis - might be just wishful thinking. After several committee members said companies should encourage homeowners to strengthen their houses against storms by offering discounts on premiums, board adviser Kurt Lewin asked how homeowners can be expected to shell out money for that. "We need to look at the economic realities of asking that," he said. When committee member Frank Kowalski said homeowners can't expect to qualify for certain coverage if they don't replace their roof every 10 years or so, Lt. Gov. Toni Jennings replied, "The roof is supposed to last as long as the house." When several committee members said a house's age helps determine its premium, Leslie Chapman-Henderson cautioned that it can't be the only determining factor, either. "We can't draw a line in the sand," she said, and decide that houses built before a certain date have to pay higher premiums. Some older houses, she said, were built during decades of heavy storms and are stronger than some newer homes. It went like that all day, back and forth between proposed solutions and why they might fail. During public testimony in the first hour, Ellinwood, a St. Petersburg interior designer and senior citizen, implored the committee not to be trapped by a defeatist attitude. "These things are all doable if you, the governor and the Legislature want them to be," Ellinwood told five committee members, who sat under a sign reading "BOLD STEPS." After public testimony, the rest of the morning was devoted to the Reform Committee's discussion of proposals, and the afternoon to legislators' presentations of their solutions. Snowbirds and residents of manufactured or mobile homes complained that the My Safe Florida Home program is a raw deal. The program, which kicked off in August, offers matching grants up to $5,000 for improvements that strengthen a house against storms. But the grants are available only to site-built homes with homestead exemptions. David A. Young, 69, drove an hour and a half from Lakeland for Thursday's meeting. He'd like to qualify for the matching grants, but he lives in a manufactured home. "I sat through three hurricanes within 15 miles of my home, and it was safer than some of the shelters that got their roofs blown off," he told committee members. Handling sinkhole claims is becoming a cottage industry for lawyers in counties like Pasco, where claims have skyrocketed in the past couple of years. "People are looking at it filing sinkhole claims like it's payday," said Stevans, who is the president of Homeowners Against Citizens. About 400 property owners took part Thursday evening in a lively town hall discussion on finding solutions to Florida's insurance crisis. to go to the hurricane catastrophe fund." "It's all about finding another way to finance the losses that are out there." "Build better buildings. Retrofit housing stock. Help people through low-cost loans." "I'd like consumer participation in the rate process. Like we have setting utility rates." "For retirees earning $13,000 to $20,000, mitigation won't work." There should be a stricter definition of sinkholes, she and others said, and a cap on what lawyers can make from those claims. 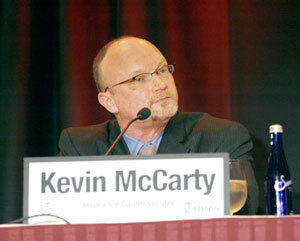 Steve Burgess, the state's insurance consumer advocate, questioned the potential conflicts of interest posed by his office's position under the authority of the chief financial officer. He said his office might function better under the Cabinet, "although that perhaps would generate its own set of criticisms," he acknowledged. 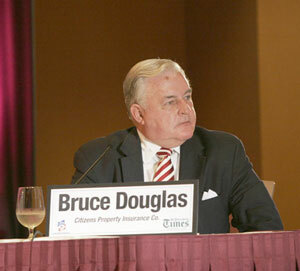 Burgess also said the insurance advocate needs more authority to be effective. The consumer advocate can recommend that the Office of Insurance Regulation challenge a rate increase, but doesn't have the explicit authority to do so himself. 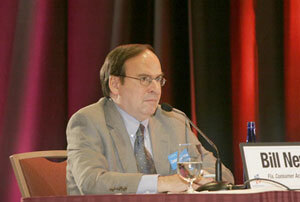 "It's pretty easy to go out and say, 'Hey, this rate's too high, don't allow it,' " said state Sen. J.D. Alexander. But doing that, he said, will chase insurers out of Florida. The Reform Committee was authorized by the governor at the end of June and is chaired by Lt. Gov. Jennings. 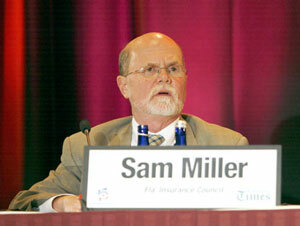 Of the 15 members, at least 10 have ties to the insurance industry. This is the committee's sixth public meeting since August, and the only one in the bay area. The meetings are meant to follow the governor's instructions to solicit public comment, though five of the planned nine are in Tallahassee. Three hours into the meeting, committee member Barbara Weese didn't seem convinced problems were being solved. The point of the cs to be done to get insurance to the people. "ommittee, said the retired schoolteacher, isn't just to make insurers more accountable, but to make insurance more affordable. "The point we're missing," she said, "is something has to be done to get insurance to the people." About 400 property owners took part Thursday evening in a lively town hall discussion on finding solutions to Florida’s insurance crisis. Adopting a penny sales tax dedicated to relief from high insurance premiums; imposing a state income tax. Prohibiting insurers from cherry-picking where they write insurance in Florida; capping rate increases. Regulating reinsurance agreements that can mask profits between insurers and their parent companies.